Cobblers connection: He may not admit as much but one suspects Justin Edinburgh would not be overly disappointed to send his old club down this weekend. The 47-year-old spent two years at Priestfield before being sacked following a poor yet not catastrophic run of form around Christmas time. He left Gillingham 17th in League One and eight points above the bottom four but they come to Sixfields on Saturday only one point and one place clear of danger, giving Edinburgh the prime opportunity to send down his former club, though to do so Port Vale would have to win at Fleetwood Town. James Heneghan’s preview: Key players signed up, safety finally assured and now the opportunity to deliver one late twist to a season that has had many; it’s rarely ever quiet at Sixfields even when there’s little to play for. It appeared Sunday’s meeting with Gillingham would be nothing more than a battle for pride with both teams’ survival guaranteed but one swing of Chris Eagles’ right leg has suddenly added a little extra spice to Justin Edinburgh’s reunion with his former club. The intriguing prospect of Edinburgh sending down his old club always looked a possibility when he swapped Priestfield for Sixfields in January, a move out of his control, and now it may well become reality following Port Vale’s unlikely late win at Walsall on Tuesday. For that to happen, Vale must win away at Fleetwood Town, who themselves need victory to potentially gain promotion to the Championship, but Cobblers fans will just be happy it is not their side sweating and nervously checking events elsewhere on the final day of the season. Their safety was confirmed in less-than-ideal fashion last weekend but the fact is they will be a League One team next season and Gillingham’s visit to Sixfields on Sunday is the first opportunity to put the building blocks in place for a smoother ride next time around. Looking at it from afar, Edinburgh’s sacking by Gillingham appeared somewhat harsh and you can see why he still feels hard done by having led the club from relegation candidates to promotion outsiders over the previous two seasons. 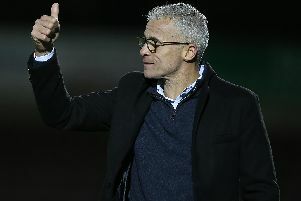 He was removed following a run of one win in five games that left the Gills 17th and eight points above the drop zone, and he admitted only this week that his downfall at Priestfield owed largely to poor recruitment in the summer. Those at Sixfields know all about that because poor recruitment also played a role in Rob Page’s sacking, which came only six days after Edinburgh’s at Gillingham. Cobblers fans will be hoping Edinburgh has learnt from his mistakes and gets his recruitment right this time around given the major overhaul that is required at Sixfields. He’s made a good start by signing up key men John-Joe O’Toole and Marc Richards, although the fact Zander Diamond’s future remains increasingly in doubt is a concern given his excellent form this season. O’Toole is one of several players – on both sides – who will miss this weekend’s clash after undergoing an operation on his troublesome groin problem. He joins long-term absentees Sam Hoskins and Gabriel Zakuani in the treatment room, which means Shaun McWilliams may get another chance to impress after providing the only ray of light on a gloomy afternoon at Bury last weekend. Gillingham also have a raft of players missing for the trip to Sixfields, including the mysterious suspension of striker Rory Donnelly, as they target the victory that will keep relegation at bay. But their recent form does not bode well, nor does their defensive record which is the worst in the division. In all they’ve conceded 79 goals, six more than the Cobblers, and they have also only one once on the road since November and only four times all season. But, as we’ve seen in Town’s last two outings, the fact that Gillingham are desperate for the points makes them dangerous opponents, so the Cobblers must be on their guard and improve on past performances if they are to end the season with a flourish.